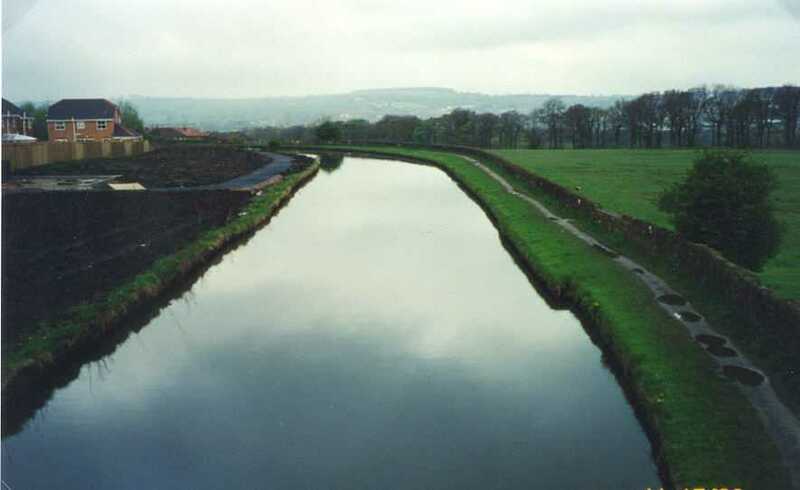 A major feature in Clayton-le-Moors is the Leeds & Liverpool Canal, an artifact of the Industrial Revolution. A westward View of the Leeds and Liverpool Canal from Highway A678 Bridge is shown below. The Leeds and Liverpool Canal was the most successful long-distance canal in Britain. In 1906 it carried 2,337,401 tons of cargo an average distance of 21.12 miles, producing around E180,000 in revenue. In overall terms of quantity of goods and distance carried, no other British canal could compare with this. The Birmingham Canal Navigation did carry more, at over seven million tons, but it did so only over short distances, the average being just eight miles. The Aire and Calder Navigation also carried slightly more, at 2.8 million tons, but here the larger size of the river locks meant that far larger boats could use the navigation. One factor in the success of the Leeds and Liverpool was its sheer size. With a main line of 1271/4 miles, it is the longest single canal in Britain. Just as important, the area through which it passes was – and is – one of the most heavily populated in the land. The canal linked Liverpool, Wigan, Blackburn, Burnley, Skipton, Keighley, Shipley, Bingley, Bradford (via the Bradford Canal) and Leeds. These towns, and others in the area, were the cradle of the revolution in textile manufacture and the Leeds and Liverpool Canal, as probably the regi,,n’s single most important transport facility, thus holds a particularly important place in English, and indeed world, history. Unlike many canals, the Leeds and Liverpool was never tied to any one particular trade or traffic. Coal, wool, cotton, limestone, grain and general cargo were all carried in huge quantities by a wide range of carriers. Partly because of this and partly because of the sheer length of the canal, the Leeds and Liverpool boasted an immense diversity of traffic. Carriers developed for particular trades and several general services were operated so successfully for so long that in negotiations with the competing railway companies the canal company usually came out on top. For many years the canal beat off the railways’ competition by being more competitive, more efficient and even, it was claimed, considerably quicker on some routes than the railways. The canal was opened from Burnley to Enfield (in Clayton-le-Moors) in 1801. It was apparently the major artery for the transport of cotton to the Blackburn area for spinning, weaving and other textile manufacturing activities. Much of the cotton may have entered the port of Liverpool from the American South. The Burnley to Enfield stretch of the canal was engineered in 1799 and opened in 1801. By 1808 the waterway had been extended to Church but final completion did not occur until 1816. The Leeds and Liverpool Canal Company had its local depot at Enfield Bridge where warehouses and offices were constructed in 1801-02. Lime Kilns (owned by the Waltons of Altham) were sited west of Whalley Road close to Victoria Mill, while there were various coal wharfs to the east of the bridge. Among the early occupants were the Altham Colliery Co., James Lomax and the Peels (prior to the opening of Church Wharf). Later tenants of the wharfs included various local coal merchants and the Accrington Gas Co. The later mills and factories also had canal side facilities, including warehouses which gave direct access to the waterway. Clarke1 (p. 37-38) also provides more in-depth historical background and the factors that led to the construction of such a huge engineering project in nineteenth century England. His discourse also provides additional insight into the driving forces behind the development of the Industrial Revolution in Lancashire County. The Pennines have always formed a major barrier to transport, communication and trade between Lanca- shire and Yorkshire. Even today, with modem technology, difficulties can still be encountered in winter on the M62 motorway. How much more uncertain must transport have been in earlier centuries when packhorse or crude horse and cart were the only ways to carry goods between the two counties. The particular geography of the Pennines was therefore of great importance. Not only were the fells and moors a considerable physical barrier, but their presence influenced the very nature and type of industry and commerce which developed on their flanks. Because of the hills, Lancashire and Yorkshire developed quite distinct economies. This is seen by the way in which Yorkshire tended to look east and south, while Lancashire had traditionally turned westwards. Yorkshire has had a long and unbroken involvement with woollen textiles, trading originally through London with the commercial centres of western Europe. Lancashire, on the other hand, had a textile industry based principally on the linen trade with Ireland, and its woollen manufacture was concerned mainly with serving, local markets. In addition, there developed in the eighteenth century a considerable coastal and international shipping trade, especially with Ireland and the Americas, and it was this that provided the most important reason for the promotion of the Leeds and Liverpool Canal, since the Bradford wool merchants desperately wanted to have access to the colonial trades working out of Liverpool. This was especially marked when, during the late-eighteenth century, the manufacturers in the Bradford area gradually took over the lucrative worsted industry from its former centre in East Anglia, while those in Lancashire expanded by creating an immensely important new textile industry based on cotton which arrived from America via Liverpool – an industry which was destined, of course, to stimulate and feed a huge explosion of industrial development in Lancashire. 1Clarke, Mike, 1994m The Leeds & Liverpool Canal – a History and Guide: Preston, Carnegie Publishing, 288 p.
Webpage posted Fall 2000. Slightly modified in format April 2011.